You’re probably wondering who we are and why we are putting on this forum. Great questions. And we’ve got solid answers. We’re Global TradeSource Ltd. (our online arm is GlobeTrade.com) and we’ve been in the business of helping entrepreneurs and small businesses go global since 1985. Yes, you read that right. Laurel Delaney, successful entrepreneur, a business owner herself and a native of Chicago, started Global TradeSource, Ltd. with the notion to help all entrepreneurs and small business owners market, sell and fulfill orders internationally. GSBB Media LLC that you see throughout our site is a wholly owned subsidiary of Global TradeSource, Ltd., which was established in 2013 to keep our No. 1 ranked blog in the world, The Global Small Business Blog, independent of all other properties due to its stand-alone popularity. With the global reach across all of our online platforms, we’ve had the opportunity to connect with more than 4.8 million viewers. What Laurel discovered early on in her career—spanning the pre- and post-Internet era—is that relationships matter, especially those when we take the time to get to know one another in person. For Laurel that meant meeting with a customer in Japan who did a small amount of business with her firm. But after that face-to-face visit, he tripled his business with her. All of that led to developing a newsletter called Borderbuster, teaching MBA International Marketing at Loyola University Chicago, writing books on exporting, developing promotional items for those interested in going global at the Global Small Business Depot, creating ExportingGuide.com and the accompanied Exporting Guide Group, and now leveraging all those initiatives to host the world’s best little Global Small Business Forum in the world. And what better place to begin then Laurel’s home city: Chicago? One of the key aspects to exporting success are the connections we forge—building relationships locally, through a supply value chain network and overseas to expand a business. That’s why the Global Small Business Forum was conceived in 2015: to be a place where participants, who largely up until now have communicated via email, Twitter, Facebook, Google+, LinkedIn, Pinterest and Instagram, now have a chance to meet face-to-face, interact, network and make new connections. After hosting three successful forums, we have discovered that we have an amazing ecosystem here in Chicago that fosters international expansion and we will continue to work hard to keep it growing. The Global Small Business Forum will take the mystery out of expanding a business globally and provide entrepreneurs and small business owners and anyone else who is interested, a whole new way of doing business with the world. Our goal with this forum is to unlock global potential in your business – have you go from zero to thousands of dollars in international sales in six months. We hope you will join us to get more ideas, drive more deals and make a mark in this world. 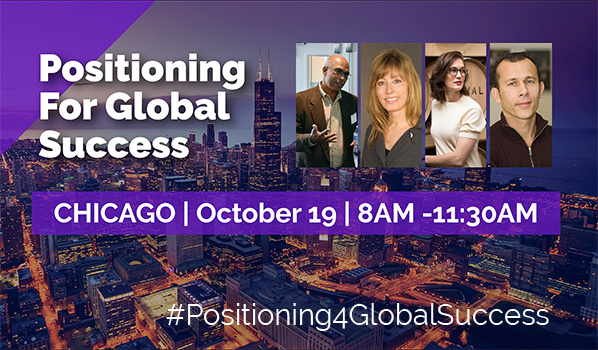 We can’t wait to connect in person to deepen our relationship and help you position your business for global success.